the Assam government on September 16 recruited 768 doctors for rural postings. "This will ensure that every panchayat has at least one doctor," said health minister Himanta Biswa Sarma after handing over appointment letters to the doctors in Guwahati. The recruitment drive was part of the state government legislation, enforced in 2002, that makes it mandatory for all mbbs graduates to serve for a minimum of one year in rural health centres after internship. Students sign the bond at the time of admission. "Without rural posting, medical graduates will not be eligible for higher studies," said Sarma. Those flouting the rule will pay the government a compensation of Rs 5 lakh--the amount that the state spends on the education of a single student. They will also be barred from practising in government and private hospitals, he said. Though reluctant earlier, young doctors are showing willingness to work in villages. "About 1,500 applications from fresh medical graduates are pending with us. All of them will be inducted for rural posting," said J B Ekka, director of National Rural Health Mission of Assam. In return, the health department has announced many incentives. "Those serving in accessible rural areas would get two bonus marks and those who serve in remote and difficult areas would be awarded three bonus marks in the post-graduate examination," said Sarma. Question papers in the post-graduate examination will be set in a way to benefit those who have served in rural areas. The doctors will receive a monthly salary of Rs 25,000 (medical graduates posted in city government hospitals get Rs 12,500 a month) along with free residential accommodation in the area of posting. "The offer is good. What's more, we are getting inducted in the government service right after graduation," said Kulesh Patir, a medical graduate. He is posted in Dholabari panchayat in Kokrajhar district. 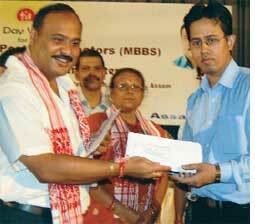 The state's three medical colleges at Guwahati, Dibrugarh and Silchar turn out 450 mbbs doctors annually.